The snow has started to fall in Grand Rapids and it’s tempting to curl up on the couch with your Netflix account and hibernate until April. But just because the temperatures are dropping doesn’t mean that there is a shortage of things to do. So round up a few friends and check out this list of fun activities, they’re sure to cure the winter blues. 1) Go to a Griffins game. Catch the 2013 Calder Cup champions in action at the Van Andel Arena. With affordable ticket prices and $2 beer and $2 hot dog nights, you can’t go wrong with Griffins hockey. 2) Ice skate at Rosa Parks Circle. 3) Hit up a local coffee shop for some hot chocolate. Take the edge off of the winter chill with a hot chocolate or a latte from one of Grand Rapids’ many cafes. The Bitter End, Wealthy Street Bakery, and Common Ground Coffee House boast warm seasonal drinks and sweet treats. 4) Escape to the tropics at Frederik Meijer Gardens. Sometimes, you’ve just have to get out of the cold. Frederik Meijer Gardens offers Michigan’s largest tropical conservatory that allows you to completely immerse yourself in the warmth of the tropics. 5) Support local with the Uptown Shop Hop. Take a stroll through the various Uptown shopping districts on December 6 from 4-10 p.m. Free shuttles are available and many businesses offer in-store specials. This is the perfect opportunity to finish (or start!) your holiday shopping and find unique gifts for anyone on your list. Keep up your motivation to run this winter with fun, themed 5k races. 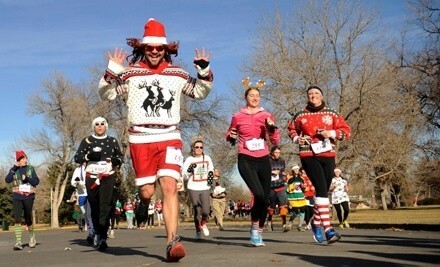 Dig out your ugliest sweater for The Ugly Sweater Run on December 1. Or, if the zany world of Dr. Seuss is more your style, mark your calendars for The Whoville 5K on December 15. 7) Take in a concert at St. Cecilia Music Center. Enjoy local musicians and performance artists from all walks of life in affordable concerts and events at St. Cecilia’s. The CARE Ballet will present T’was the Night Before Christmas November 29-December 1. The Grand Band and Grand String Orchestra will perform an afternoon of seasonal music on December 15. 8) Check out a spoken word poetry event. The annual Kent Innovation Poetry Slam takes place on December 6 at Schuler’s Books on Alpine Avenue. Students from Kent Innovation High School will perform original poetry. Or if you want to share poetry of your own and need a little liquid courage, check out The Drunken Retort, every Monday night at Stella’s Lounge. 9) See a Meanwhile Movie at Wealthy Street Theatre. Find comfort in watching your favorite cult movies on the big screen again. Every Tuesday night catch a classic movie at Wealthy Street Theatre. Then, head over to The Meanwhile Bar for drink specials. Upcoming movies include Gremlins and The Goonies! Tagged activities, grand rapids, Winter.